Picture the scene, t’was the week before Christmas and Ed Miliband and his advisers were worried about the rise of UKIP. The pointy heads were ordered to come up with a new policy. Answer the racist myths about immigrants and asylum seekers? Of course not! This is New ‘One Nation’ Labour. 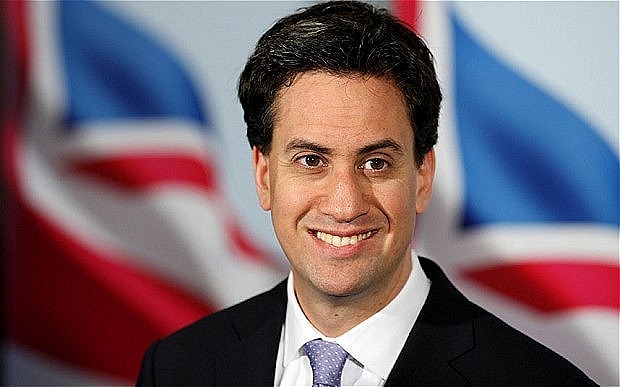 Miliband’s recent speech on English and immigration has been described as a ‘dog whistle’ to voters who due to confusion and constant anti-immigrant propaganda in the press have formed racist ideas. We have become used to New Labour’s historical shift to the right but this latest policy is a new low. Miliband seems to lack any even vaguely liberal principles and bases his politics on trying to find accommodation with the agenda dictated by the right wing through the media. A genuine socialist party would answer the lazy stereotypes about migrant’s language skills and supposed lack of integration with facts and figures and NOT pander to racist ideas. Is there really a problem with social integration of migrants because of their poor English language skills? The 2011 census reveals that there are twice as many people of mixed ethnicity than there were in 2001. This does not indicate a longterm problem with integration. The real segregation in the UK results from poverty not race and is a class divide. During New Labour’s time in government the number of people privately renting almost doubled between 2001 and 2011. The numbers with mortgages had fallen quickly, from 39% in 2001 to be just 33% all households by 2011. Miliband said: “Britain is at its best when it comes together as a nation, not when it stands divided. That’s what One Nation is about.” These are hollow, empty words. During the last Labour government the UK became more divided in terms of wealth, income and housing. During the Oldham disturbances in 2001 the young British Asians who were involved spoke with Lancashire accents. Clearly the underlying problems which caused the riots were poverty, inequality and racism not language. § People who need English language education to live and work in the UK should have a statutory entitlement to ESOL. § Language education is a public good which contributes to society as a whole. This should be recognised through the availability of an accessible, comprehensive and integrated system of ESOL provision, in which financial and other barriers to participation are removed. § Funding mechanisms should be transparent and encourage co-operation between providers, not competition. In particular, attention should be given to the lack of co-operation between different agencies, notably FE colleges and Jobcentre Plus2. § The opportunity to learn the common language of the community in which you live and work is a human right. § Access to ESOL should be independent of immigration status. ESOL classes should be free to all, including newly-arrived spouses, asylum seekers and students who are working. The rise of UKIP is a danger to the working class but racist ideas will not be countered with a sort of ‘racism lite’ being offered by Miliband. The policy is particularly insidious as it based on complete myths. Miliband should know from his own experience as the son of immigrants that no-one who goes to live and work in another country ‘decides’ not to learn the language of that country. An ESOL teacher commented to me recently that the only barrier she comes across to migrants learning English is the lack of free English language classes. Inventing a supposed problem like ‘not wanting to learn English’ is insulting, perpetuates myths about immigrants and causes divisions. It is also a welcome diversion for the ruling class from the cuts and the crisis of capitalism. Learning a second or third language can be one of the most rewarding experiences a human being can have in their lives but it is not easy. Success depends on multiple factors such as age and opportunity. If migrants have the right to live and work in the UK they should also have the the right to access free language classes for themselves and family members if required. Socialists must oppose the scapegoating of migrants and answer the myths about their language skills. We must also oppose any idea that minimum language standards should be imposed on anyone. Most migrants learn the language to the level for their needs. It is a completely invented ‘problem.’ I know of no children of immigrants who are not native speakers of the language of the country their parents have migrated to. Outside of the UK the British are known as notoriously monolingual and unwilling to learn other languages. This has something to do with the position of English as a world language due to the dominance of USA capitalism during the 20th century. The majority of the world’s population are in fact bilingual and multi-lingual. Migrants in the UK especially from the Indian sub-continent are usually fluent in two or three languages. Instead of celebrating their contribution and the diversity it brings Miliband tail ends a party like UKIP. Despite the fine phrases about a common culture and one nation Miliband’s speech is a cover for blaming immigrants for the problems of poverty and class inequality created by capitalism. Migrants cannot be beaten with a stick into a mythical British culture to be measured by their English language level. We reject any form of coercion when it comes to language. Socialists need to respect the language rights of all and campaign for a properly funded ESOL service and fight for the unity of all working people whatever language or dialect they speak. Amaia Barakaldo Egaña climbed onto a chair and jumped from the fourth floor of her building. This was the second high-profile death related to mortgage foreclosure in only a few weeks. The outstanding debt default which led to the eviction was less than € 214,000. José Miguel Domingo, 53, was found dead in the courtyard of his home in the neighbourhood of Chana in the city of Granada. Joseph had a loan for 240,000 euros. A man also jumped from a balcony in Valencia before being evicted. He was hospitalized with serious injuries. They are the last three known cases of a social drama that is taking place in the Spanish state, a graphic reflection of the barbarism of the system and the crisis of capitalism. Every day of the first half of this year (2012) 500 evictions were executed in the Spanish state, a social drama that overflowed into a people’s revolt with the second suicide in 15 days. These tragic cases have caused widespread shock and anger. During the march, protesters chanted slogans against the banks and financial institutions daubed “murderers” on their windows. Paint cans were thrown at the bank ‘La Caixa’ where Amaia had her mortgage. The demonstrators chanted slogans: “Not a suicide, a homicide,” “They have the money, we have the dead”, “No eviction without response” or “Stop financial terrorism”. The public reaction has shaken both the PP and PSOE and they have been forced to be seen to be ‘doing something’ about the issue, entering emergency negotiations to agree on a “humanitarian” bill to stop executions in very limited extreme circumstances. It was the pressure from social movements and the street that has obliged them. PSOE particularly must be condemned particularly for its opportunism. During last PSOE government issue was repeatedly raised IU / ICV and measures were put forward to end the drama of evictions. These measures were repeatedly rejected by PP and PSOE. The Basque Police union, Erne, also said that the organization will support and provide legal defence to members who refuse to participate in evictions. The reactions of the police and the judges in the face of the protests are very significant. The PP policy of cuts and attacks on living standards of workers is reaping a whirlwind of opposition. These cracks are the first to be seen in the state machinery. Clearly many in the police and judiciary have no desire to continue with the policies of the PP and its consequences. The TV channel La Sexta has shown images of police actions in which they resemble an occupation army. They are seen going from house to house throwing families out of their homes. The feeling of great injustice is a very bitter taste in the mouths of millions in Spain. Even the Queen daytime television presenters, Ana Rosa Quintana, dared to call for civil disobedience! Because of this social pressure, in Euskadi, Kutxa and Caja Laboral had to immediately suspend all evictions, even before the PP government announced their measures. Although clearly insufficient, the temporary measures that the PP government have announced can be considered a victory since they would never have been implemented without pressure from below. The anti-evictions movement also shows that a sustained and determined movement can force the government to back down. However, the fight should not stop here. The conditions of the two year moratorium are very restrictive and the problem is far from solved. The consequences of evictions and the opposition will continue. Mortgage law and the law of civil procedure will be untouched. People who are evicted in Spain face abusive default interest charges and court costs. As well as losing their homes they also have to keep paying the mortgage even though the bank can sell their property! The PP Economic minister, Luis de Guindos claims that people have to rely on the Banking Code and the willingness of the banks to follow ‘good practice.’ Some hope! There is one law for the working class and another for bankers and big business. Since 2008 bankers and politicians have ruined building societies and banks yet have received multi-million euro payoffs while in the same time period half a million working class families have lost their homes in Spain. Perhaps the saddest aspect of Amaia case was that she was a PSOE member along with her husband and a former councillor. A party with ’Socialist’ in its name should offer a vision of the future and have a programme to fight the injustices of capitalism. However, these tasks are on the shoulders the left real. Our challenge is to completely stop ALL EVICTIONS and nationalise the banks and use their enormous wealth and empty housing stock to ensure the right to adequate housing through social rents for all workers and their families.